For the first time this season Liberal Redskins have won two consecutive games. 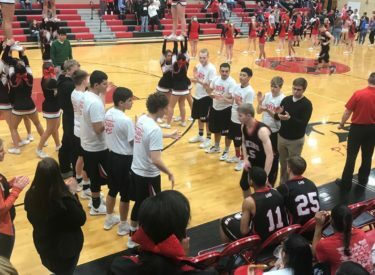 The Skins gained that elusive momentum with a 57-46 win at Panther Fieldhouse in Great Bend Saturday night. The Redskins also gained their first WAC win of the season. Liberal led 14-9 after one quarter before the teams were tied at the half. The Redskins used a 17-6 run to pull away. Cameron Riley led Liberal with 15 points and Lee Hatcher had 14. Tristen Bigham and Kace Vongsakda had nine a piece. It’s Liberal’s 12th win in the past 14 games against the Panthers and their fourth straight win at Great Bend. Liberal is 8-10 and 1-5 in the WAC while the Panthers are 4-15 and 2-5 in the WAC. Liberal hosts Garden City for Senior Night Tuesday at about 8 on 1270 and kscbnews.net.